Why did you leave Iowa to come to NIU? I knew that I wanted to go to an out-of-state school, and I had a friend who had previously gone to NIU. After looking at the website and thinking about it, I decided to apply. 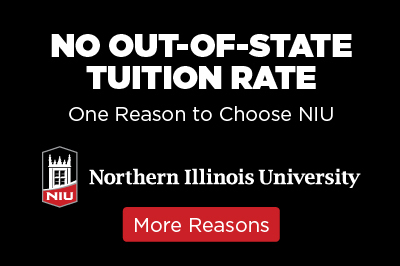 Once accepted, I chose NIU because it was the most affordable and the closest to home. Why should other students come to NIU? I’m a firm believer that there’s a right college for everyone. NIU is that for me. NIU has an amazing campus with so many different options for study, which is a huge plus. I’ve never met professors as caring as the ones here, who genuinely want to see all of us succeed. There are a bunch of resources and opportunities for each person on campus as it concerns campus life and your future career. What was your biggest concern coming to NIU from another state, and was it resolved? My biggest concern was finances because most out of state schools cost more. I was very happy when NIU got rid of the out of state tuition rate, so I don’t pay extra to study here. What do you love about NIU/Illinois? NIU feels like home now and I’ve gotten to know a lot of people and had some really amazing experiences here. Illinois is pretty similar to Iowa (I’m at home beside the cornfields), but it’s really awesome being closer to Chicago now! As an avid concert goer, it’s easy to get to the city.